During the same period, the proportion of children 5 years old who met the recommended guidelines for physical activity for their age group (at least 60 minutes of moderate-to-vigorous physical activity every day) was 32.4% for children with a healthy weight versus 23.7% for children overweight or obese and 20.7% for children in single-child households versus 31.7% for children in non-single-child households. 2Puhl RM, Heuer CA. 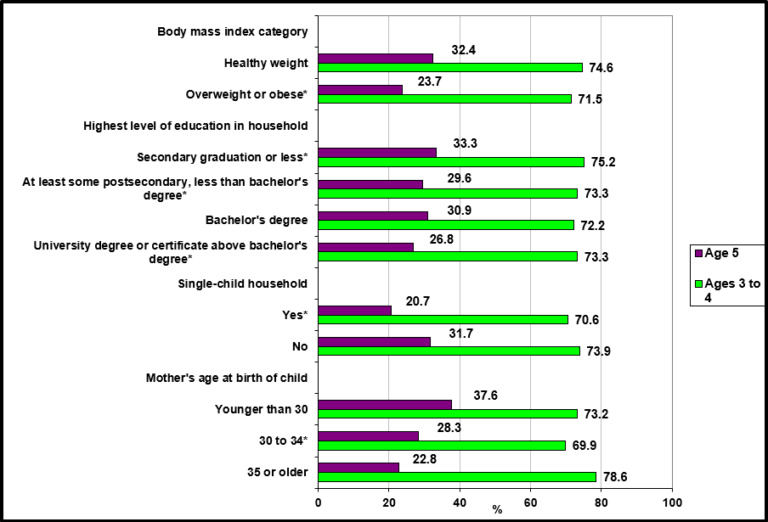 Obesity stigma: important considerations for public health. Am J Public Health. 2010;100(6):1019-28. 4Barkley JE, Salvy SJ, Roemmich JN. The effect of simulated ostracism on physical activity behavior in children. Pediatrics2012;129:e659–666. 5Jackson SE, Steptoe A. Association between perceived weight discrimination and physical activity: a population-based study among English middle-aged and older adults. BMJ Open 2017;7:e014592.